Utilising a VxWorks Hypervisor / Windows system allows the familiar user interface of Windows to be used to drive a Safety Critical VxWorks system. In this case, our customer has developed a medical device that needs a certified Safety Critical system to keep a human organ alive, whilst displaying vital information to a doctor on a small screen. The perfect solution is to combine VxWorks and Microsoft Windows (7 or 10), using the VxWorks Hypervisor. The Hypervisor forces each OS to exist independently of the other OSs. So if (hee) Windows crashes, the VxWorks Guest OS is still running, keeping the organ alive. The safely critical code can be certified and left in place, whilst the GUI can be changed and updated without re-certification. 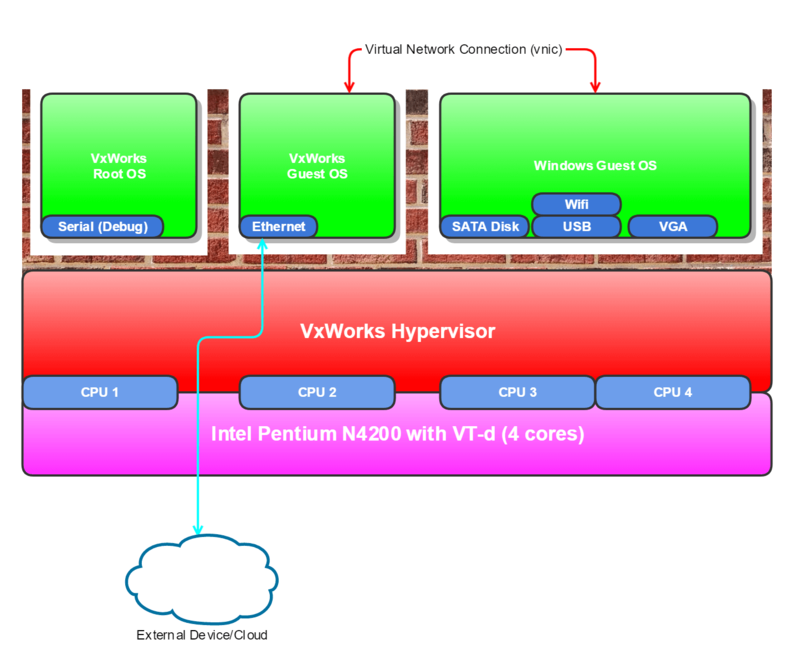 a VxWorks Root OS – which we leave alone to manage the Hypervisor. a VxWorks Guest OS – which will communicate with the outside world, keep the organ alive and forward information to the Windows partition. a Windows Guest OS – which houses the Graphical User Interface. a Virtual Network Interface (vnic) – which provides a virtual ethernet link between the VxWorks Guest OS and Windows Guest OS. custom built VxWorks communications tasks to manage socket connections between the players in the system. Configuring and setting up this up took a lot of work. The correct hardware had to be sourced (an Intel x86 chip is needed with VT-d for Hypervisor to work), VxWorks installed, VSBs and VIPs configured and built, startup scripts written, VNIC drivers added and custom software created to create the tasks and sockets that all the application to communicate. In addition everything needs to boot of the internal Flash disk, and be secure! The Reference System runs on a Capa312 x86 development board. The CAPA312 is a fanless 3.5-inch embedded motherboard, powered by the Intel® Pentium® processor N4200 or Celeron® processor N3350 (codename: Apollo Lake). This 3.5” embedded board was designed for operational stability in a wide operating temperature range from -20°C to +60°C (or optionally up to +70°C) and requires only +12V DC power input. It also comes with rich I/O connectors, various display interfaces and two PCI Express Mini Card slots for a wide array of industrial applications. 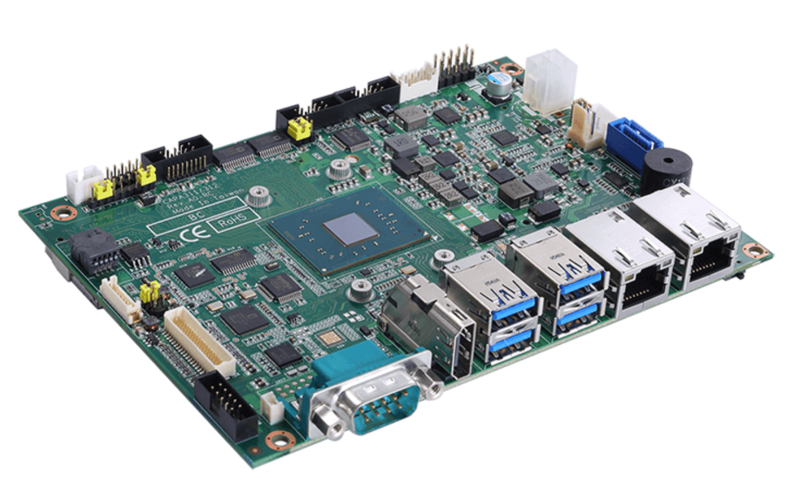 This outstanding 3.5” embedded SBC is a performance-driven solution for IoT/M2M related applications, such as industrial automation, self-service terminals, digital signage, POS/kiosk displays, medical, and more. To aid anyone who would like to uses a similar system, we are offering this as a Reference System. We can supply you the hardware, software, configuration and consultancy to get you up and running within days, so you can benefit from the advantages that the Hypervisor brings, without any of the pain to set it up. We can even come on-site to get you up to speed with the technology, and to customise the Reference Platform to your specific requirements. Applications for Internet of Things, Industrial Control, Medical Systems, AI Robot Death Machines – Anything that needs a Windows front end and a Safety Critical heart!